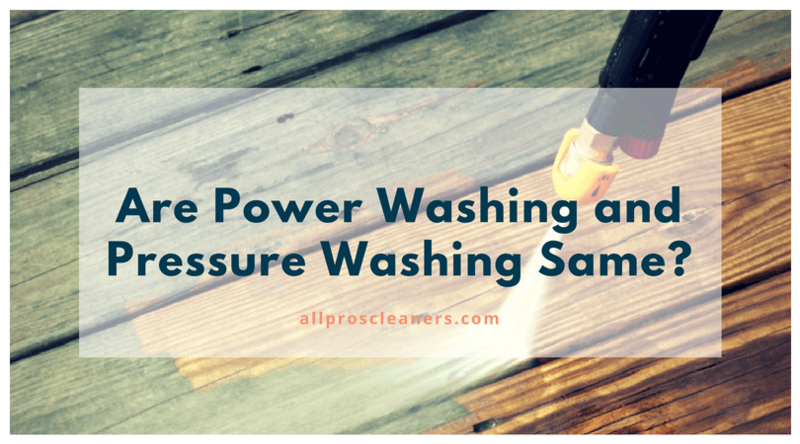 All Pro Carpet CareBlogPower WashingAre Power Washing and Pressure Washing Same? Are Power Washing and Pressure Washing Same? You might often come across the terms pressure washing and power washing used interchangeably. What do you think, are they the same thing? Or completely different? After these questions, you might get more confused, but don’t worry we are here to clear up things for you, not mess up or to make the term more complex. To make it short and simple, both the methods are the same but one factor makes them different. The prime function is similar: they require high pressurized water to help eliminate dirt and other unwanted materials from the hard surface. Furthermore, both are very similar processes, there are some key points which differentiates the process and shows how to use each service. Knowing these differences will help you to determine which service you actually need to help for getting your home looking fresh and clean again. Water pressure is concerned as an important part in both the methods. They use the same amount of pressure. The pressure amount mainly depends on the type of machine. An industrial machine is more powerful as compared to the residential unit machine. If we only talk about the types of machines. then there is only one key element that diverges power washer from a pressure washer is a heating element. Both machines inject the stream of high-pressure water, but in power washer, hot water is injected. This is a very small difference but make a huge difference when it is used. In power washing, a high-pressure stream of very hot water is injected into the surface to eliminate the dirt and materials. The fusion of high pressure and the temperature of the water make it easy to remove all unwanted materials on the surface. It’s best for eliminating residues like mildews, salts and mold from the patios, driveways and many more. The additional heat makes it particularly good at eliminating things like chewing gums on the sidewalks. It is also good to deal with grease stains on driveways or garage floors. It is useful to control weeds and moss. The high force of hot water can kill them and stop them from growing on the way. Power washing is the ideal way when the surface is heavily saturated with the elements which are making your surface look dirty. Pressure washing is the method which you can use more frequently in your home. Furthermore, it uses the same high-pressure water blast as power washing but doesn’t use heated water. Even Though having normal temperature water, it does an amazing job by removing the dirt. In addition, it also will face winning against mold and other tough substances. The only difficulty you might face, it will not be able to remove the tough stains from concrete. If you think your driveways, patios or any surface of your residential or commercial property needs a power washing, Call All Pro Carpet & Tile Care at 661-747-4441. Our Company is happy to help you. We are one of the best cleaning service providers in Bakersfield. We provide power washing in Bakersfield and nearby areas. You can also visit our Contact us page where you can fill up the form and send us a request. Call us today! And get the best cleaning deals and services. Great blog! Thanks for the awesome info.